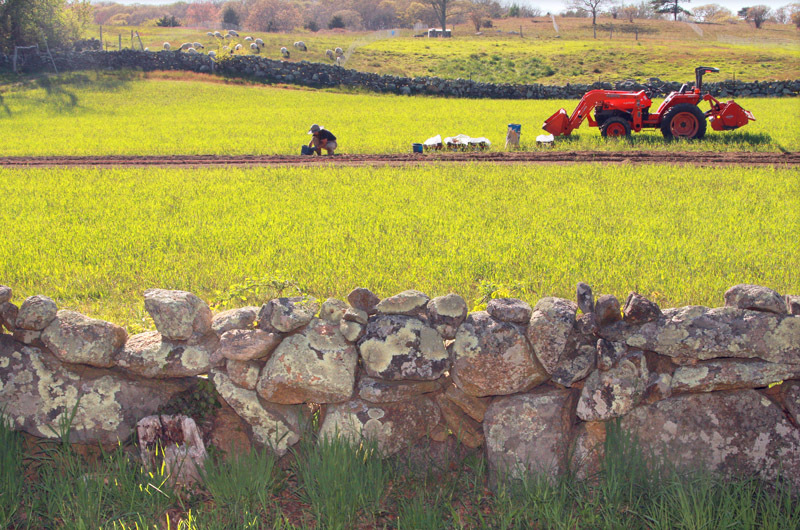 This is the traditional lead-up to the weekend that marks the unofficial start of summer on the Vineyard. And this year is no different. After a long winter nap, the Island is bustling again. We’re never ready, Islanders say. Here we come, visitors and summer residents say. Everywhere you looked this week, the rhythms of late May were in evidence. Streets were clogged with contractors and landscapers of every stripe, cell phones pressed to ears, rushing to finish jobs before homeowners arrive. The first tour bus was spotted on Church street in Edgartown. In down-Island villages, restaurant and shop owners were hanging flags, planting window boxes and throwing open their doors to let in the salty air and a new season. Even in the natural world, there appears to be a rush to make up for lost time, after a cold spring kept the daffodil show on stage for weeks on end, but slowed the arrival of nearly every other early harbinger. Now the jonquils are a distant memory, lilacs went by so fast there was barely time to cut some for the kitchen farm table, and bridal wreath is blooming with lily of the valley hard on its heels. Joe Pye weed is pushing up through the grassy places trampled by deer at night near morainal freshwater streams mid-Island. At Sheriff’s Pond in Edgartown, thickets of red chokeberry are covered in graceful white-pink blooms. A pair of swans leads a short procession of fuzzy gray cygnets in and out of the pond. Memo to walkers and their dogs: be wary of getting too close. Memorial Day is Monday. Islanders will join the rest of the country in celebrating the national holiday, established in 1868 to honor members of the armed forces who died while serving their country. A parade steps off at the American Legion Post in Vineyard Haven at 10 a.m. At the Avenue of Flags at the Oak Grove Cemetery in Vineyard Haven, volunteers will be out in the early morning hours, placing hundreds of commemorative flags. In another longstanding, unique Vineyard tradition, on Friday school children in Edgartown, Vineyard Haven and Chilmark will march to the water’s edge for ceremonies to remember those who were lost in maritime service to their country. There will be music, recitations and flowers dropped into the sea. Also by long tradition, on Monday the Tisbury town picnic will he held on the shores of Lake Tashmoo with open grills, music and rowboat races. The whole Island is invited to join the party, which gets under way at noon. So pack a lunch, bring the kids and house guests too. Because even more than a parade, everybody loves a picnic. The weekend also marks the kickoff to the summer fundraising season, when a wide and sometimes dizzying array of vital Island nonprofits hold events to raise money for their causes. It begins Friday with the Friends of Family Planning Art Show and Sale which will be staged at the Agricultural Hall through Sunday. Dozens of Island artists donate their work to this important fundraiser that helps to keep the Family Planning office open to serve the needs of Islanders throughout the year. Sending best wishes to all Gazette readers near and far for a safe and happy Memorial Day. Please slow down on the roads, and remember not to drink and drive.